In anticipation of many more happy chicken Sundays, I have just pre-ordered Diana Henry’s mouthwatering-looking book, A Bird in the Hand. I may also need to get some more chardonnay in. I don’t always go chardy with chicken. With thyme under the skin, I like valpolicella, or some other sappy, kicky Italian red. With the festive feel of crispy prosciutto and nutmeg I like a warmer Italian red, perhaps sangiovese. But when there’s just butter, lemon and salt involved, I am all over the chardonnay. As I’ve been drinking less but better recently, I’ve been spending more per bottle and not buying as many bottle. I have really fallen in love with both of these. Two new world chardies, oaked but not over-oaked – instead, pristine and gleaming. 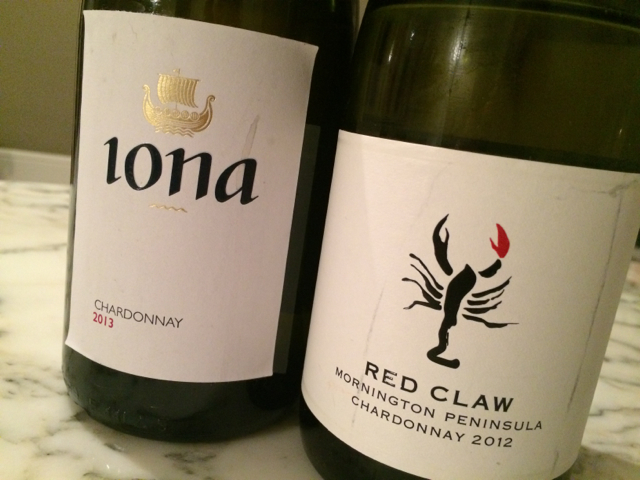 Iona Chardonnay 2013 South Africa (£14.99, M&S) – Comes at you in cool slices, clean and vibrant, interwoven with a gentle apple-wood smokiness. Elgin is a cooler part of SA, near Cape Town, once famous for its apple orchards, now for its wine. Burgundy watch out. Yabby Lake Red Claw Chardonnay 2012 Mornington Peninsula, Australia (Well it was from Swig – they’ve sold out. Keep your eyes open for the next delivery) The Mornington Peninsula – south-east from Melbourne – has been getting itself quite a reputation. The grapes that do particularly well here are pinot noir and chardonnay. I’m talking plumply aromatic pinot noir and chardonnay that tastes like Cameron Diaz looks – blonde, surfer and streamline. I bought this in late summer, and only just got round to drinking it recently. It’s bright and contemporary, and aged in very good French oak.